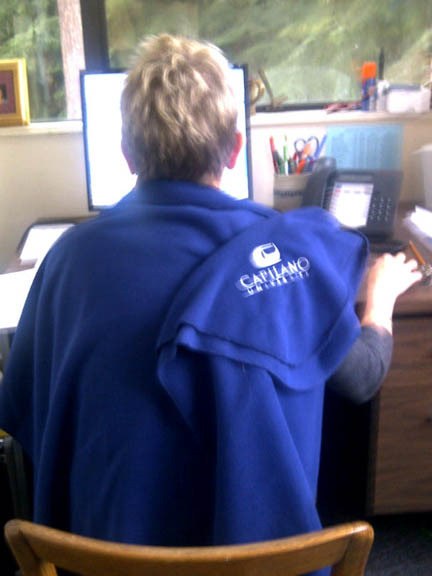 A Capilano University employee keeps warm by wrapping herself in a soft fleece blanket provided through a unique program sponsored by BC Hydro and FortisBC. (NORTH VANCOUVER, B.C. )—With many power-challenged communities in British Columbian feeling the pinch of Old Man Winter over the past few days, Capilano University has found an innovative way to stay warm while doing its part to conserve energy. Get UR Fleece On is a unique campaign being run only at Capilano University where employees are given a free fleece blanket to wrap around their shoulders, lap or feet while at their desk. The university has handed out 200 blankets at its North Vancouver campus since the campaign began last December. That number is expected to grow once a new batch arrives and when the university’s regional campuses receive their share during the first week of February. BC Hydro and FortisBC have partnered with Capilano University to provide the blankets that are made from 100% recycled material. The ultimate goal is to eliminate all space heaters at all three campuses. In 2010, Cap’s buildings’ energy consumption represented 94% of its total greenhouse gas emissions. As the university strives towards continuing reductions to its carbon footprint, this will also result in decreasing costs for mandatory offset purchases, as required by LiveSmart BC, in order to be net zero. In 2010, carbon offsets cost Cap $54,000. Capilano University is a learner-centred university that serves the communities of the Lower Mainland, Howe Sound, and the Sunshine Coast through campuses in North Vancouver, Squamish and Sechelt. Opened in 1968, enrolment today totals 7,500 students in credit programs each term with an additional 7,000 people taking non-credit courses annually. Capilano University offers a complete range of preparatory courses, university-level arts and science courses, business and management studies, creative and applied arts programs, health and human services programs, plus a range of services in support of student learning and success. Credentials awarded include bachelor degrees, associate degrees, post-baccalaureate diplomas, advanced diplomas, diplomas, certificates and statements of completion. (NORTH VANCOUVER, B.C. )–Capilano University and Encorp Pacific (Canada) today announced a pilot program aimed at increasing the use of onsite containers for recyclable beverages at Cap’s North Vancouver campus. A 2010 Beverage Container Return Study found that single men between the ages of 18 to 34 living in urban areas are the highest discarders of beverage containers. A heavy discarder is defined as those who typically discard at least two containers per week (not recycle). They are likely to work outside the home or are students. While Cap U has 14 different streams of waste diversion currently in use at its three campuses and is regarded as a leader in post-secondary in managing waste and implementing waste management programs, it views this partnership as a way to become even better. The project will see new recyclable waste bins that are easier to manage and that have better signage for refundables placed around the campus. In addition, the venture will involve close to 100 Cap U students who will be working on the project as part of their coursework. Students in Cap’s Environmental Geography program and Tourism and Outdoor Rec program will perform waste audits at the North Vancouver campus on Tuesday, September 20 and Tuesday, November 15. Audit results will then be compiled and recommendations made that will assist Encorp in implementing this project at other post-secondary institutions. Students from the Business faculty’s Leadership in Teams program will prepare promotional and educational materials to market the revamped recycling program to the Cap U community. A final report will be delivered at the end of the project and will be available on Encorp’s website. ABD Solutions Ltd. will provide on-site collection for beverage container recycling and Smithrite Disposal Ltd. will provide services for the students to conduct the two waste audits. Encorp Pacific (Canada) is funding the pilot project and has installed new beverage container recycling bins around the North Vancouver campus. Capilano University administration is coordinating the various onsite components of the pilot. Capilano University is a teaching-focused university that serves the communities of the Lower Mainland, Howe Sound, and the Sunshine Coast through campuses in North Vancouver, Squamish and Sechelt. Enrolment totals 7,500 students in credit programs each term with an additional 7,000 people taking non-credit courses annually. Capilano University offers a complete range of preparatory courses, university-level arts and science courses, business and management studies, creative and applied arts programs, health and human services programs, plus a range of services in support of student learning and success. Credentials awarded include bachelor degrees, associate degrees, post-baccalaureate diplomas, advanced diplomas, diplomas, certificates and statements of completion.